Thousands of people came to visit Dalegate Market and Deepdale Backpackers & Camping in Burnham Deepdale on the beautiful North Norfolk Coast. The idea of the weekend was to entertain and educate, highlighting the great activities this glorious part of the world has to offer, while preventing damage to its environment which is so important to the fishing, farming and tourism industries. 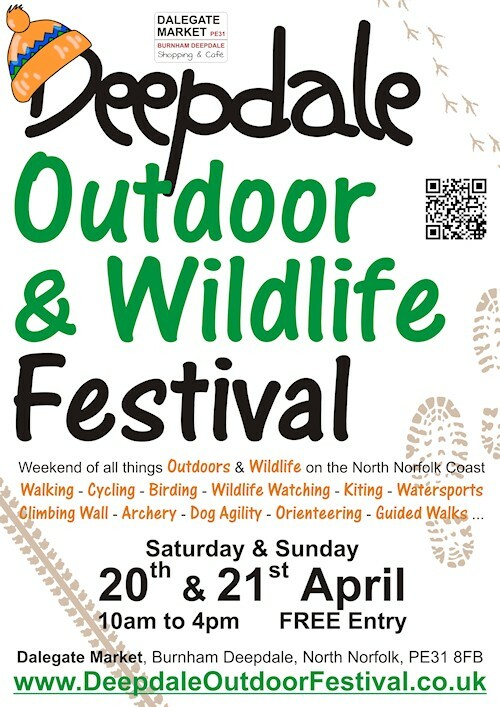 Dalegate Market has become know as the home of lovely shops, Deepdale Café and of course the Deepdale Christmas Market, so the Deepdale Outdoor & Wildlife Festival is a new attraction. Organisations like the National Trust, RSPB and Eastern Sea Fisheries explained the wildlife of this beautiful part of the world. The climbing wall, guided walks, orienteering and bird watching tours kept visitors entertained. “We were really pleased with the way the programme came together over the last few months. Personally I wasn’t tempted by the climbing wall, but there was always a queue of (younger) visitors who fancied the challenge. My personal favourite was the rescued barn owl with the Seal & Bird Rescue Trust.” said Estelle Townshend, one of the organisers. Two of the most enjoyed highlights were the archery on Saturday, organised by Active Norfolk, and the Deepdale Dog Show on Sunday, organised by Animal Magic Dog Club and the Deepdale Backpackers & Camping team. The archery instructor was kept busy all day and there were loads of entries for the Deepdale Dog Show. The Deepdale dogs, Jazz and Merlin, even came away with a rosette, but the competition was fierce for categories like Prettiest Girl, Handsomest Boy and Film Star. The shops, café, backpackers hostel, campsite and glamping in Burnham Deepdale are open throughout the year, so visitors are most welcome come rain or shine to this beautiful part of the world.